Guillermo Del Toro is one of the more interesting figures in the movie making industry given his unique artistic vision and clear passion for what he creates. And while he predominantly deals in the realms of horror, he has demonstrated interesting range with big summer blockbuster flicks like Pacific Rim among others. So when news broke out that Del Toro was behind the animated feature project The Book of Life, I was both surprised and excited. Here was something rather new from Del Toro (although you could argue his Hellboy movies had similar sensibilities in some ways) and the early looks at the movie looked pretty stunning. And this was a movie that was centered around the Mexican Day of the Dead (Día de Muertos), a rather interesting take on the need to remember the dead. My first exposure to this aspect of Mexican culture was actually through the classic LucasArts adventure game, Grim Fandango. The game literally took you to a weird afterlife with the skeletal protagonist Manny Calavera. But that could hardly prepare me for the visual feast that this movie turned out to be. 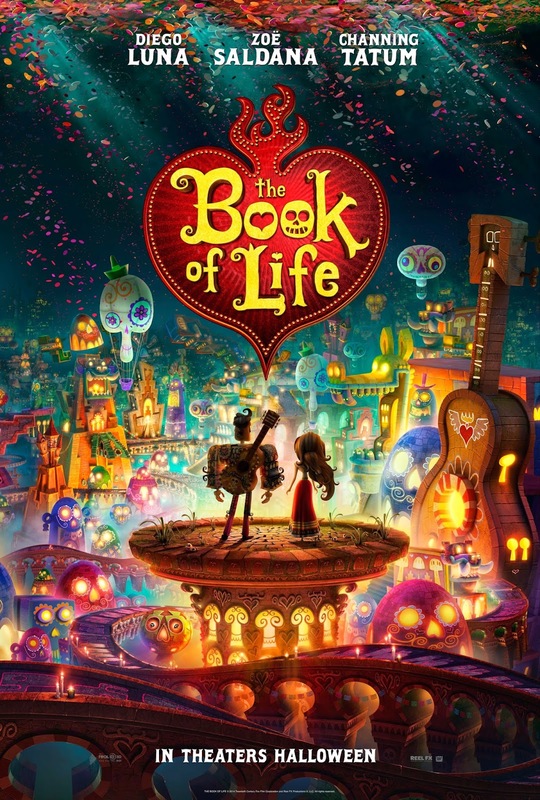 Synopsis: Book of Life is a CGI animated musical comedy directed by Jorge Gutierrez with producers Aaron Berger, Brad Booker, Guillermo Del Toro, and Carina Schulze. The screenplay was written by Jorge Gutierrez and Doug Langdale. The starts off at a museum with various school buses dropping kids off for fields trips. Finally a group of particularly challenging students arrives and eventually tour guide Mary Beth (Christina Applegate) takes the group on an alternative museum tour through a separate wing. There they're exposed to famous Mexican myths and folklore, particularly centered around the Book of Life that is said to contain all stories. Using some wooden puppets stored nearby, Mary Beth goes on to tell the story of a wager between La Muerte (Kate del Castillo), the goddess who rules the Land of the Remembered, and Xibalba (Ron Perlman), the god who rules the Land of the Forgotten). With the right to rule the far more pleasant Land of the Remembered the Remembered on the line, the wager revolves around three childhood friends - Maria (Zoe Saldana), Joaquin (Channing Tatum), and Manolo (Diego Luna). La Muerte favors Manolo while Xibalba favors Joaquin and whoever manages to marry Maria will determine the victor. From the very beginning, I appreciated how the movie wanted to tackle the classic issue of women being reduced to "damsel in distress" figures in children's movies. As much as the wager is about who might win the hand of Maria, she herself quickly declares that she'll determine for herself whether she is to get married or not and consistently demonstrated how she was an equal for Manolo and Joaquin. And yet she was still highly feminine and still celebrated certain traits of being a woman, while still asserting her own skills and her right to make her own decisions. She didn't necessarily come across as being defiant of tradition or anything like that - people just accepted her for who she was more than anything else. And between Manolo and Joaquin, one can't easily say that one was more suited for Maria over the other. Beyond the whole marriage wager, both boys (and eventually young men) were dealing with the burden of their respective family legacies. Joaquin seems determined to honor the memory of his father, the great champion of the innocent (although his mother seems to be absent), while Manolo is torn between his love for music and the family tradition of bullfighting. And again the movie defies convention by ensuring that we don't fall into old tropes. Joaquin's marriage proposal isn't immediately answered. Manolo's big effort to serenade Maria doesn't automatically win her hand. The list goes on and on. And thus the movie maintains a pretty even manner of representing life without falling back to old gender stereotypes. And not even the rivalry between La Muerte and Xiabalba is all that predictable. They aren't necessarily the good and the bad - they are just different deities that ultimately represent different interests. I appreciated the decision to have the "story" being told to the kids represented by CGI wooden figures in a rather real world. There was really no need to go this route, but they still did and it added a nice bit of visual flair to things. The various scenes were quite vibrant as needed, celebrating Mexican culture with bold explosions of color. Combined with a lovely musical score, the whole thing was quite the enjoyable little piece. I was initially surprised by the use of contemporary songs in a Moulin Rouge sort of musical approach to things. But thankfully the movie still used original music for key scenes, thus providing a nicely rounded out musical experience. And while not all songs (or song choices) were the greatest for the effort, the movie still nicely addressed this side of things. My partner, Tobie, had a good assessment of the movie. From his view, Guillermo Del Toro (even as a producer) shines when he's celebrating culture. We saw that in how well Pan's Labyrinth came across and that same passion filtered through this project together with the director's vision. The Book of Life is a fun attempt to tell a classic aspect of Mexican folklore in a more contemporary manner. It's a good story, but not necessarily an amazing comedy, but on the whole it's more than worth the movie time. Thus the film gets 4.5 charming displays of Mexican culture out of a possible 5.